By Travis - Brazil - 09 Aug/03 - Viewed 1621 times. We returned to Ubatuba intending to wrap up our South American tour by relaxing, working on our tans, and trying to learn to surf one last time�mission accomplished. We arrived on Sunday afternoon, and had quite a walk from the bus station to the tourist office. The man at the counter tried his best, but we later ran into Fabricio, an English-speaking restaurant (our Portuguese was still lacking), who recommended several beaches and a good hotel. The next morning we took a local bus to Praia Grande, where we had seen loads of stands renting surfboards the day before. Come to find out, the guys who rent the boards are only there on the weekend�a little disconcerting since we showed up on Monday. After a brief panic and about an hour of searching and asking around, we located a little surfboard repair shop that had a longboard for rent. My luck continued when, about an hour later, the local surf-instruction guru (Nado) showed up and offered his services. After about thirty minutes, I was able to stand up on the board and ride the smaller waves after they had broken and rumbled toward the shore. I really enjoyed it, especially after the frustration (and physical torment) of my earlier attempts. We spent six days in Ubatuba all together. 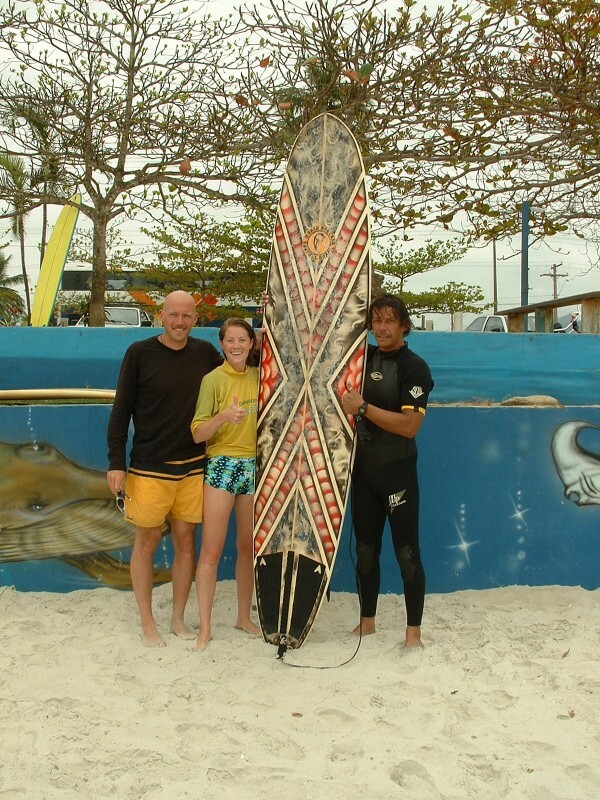 I had two more surf lessons, and Abi got into it as well. On the last morning there, we had to take the bus to Sao Paulo at 2:30, I rented a surfboard and went out on my own. I had a couple of okay rides, then, just as my time was running out, I caught a nice sized wave and took it all the way in. I felt like a little boy who just got a brand new bicycle on Christmas morning. The rest of our time in Ubatuba was taken up with side trips to several of the 72 beaches in the area. We had several nice meals there, until we came across Sucolandia a couple doors down from our pousada. The main attraction was the dozens of varieties of suco (juice), of which our favorite was strawberry with milk. The price was right too, at $1.00 for two large tumblers. To supplement our liquid diet, we usually had a piece or two of cheese bread, which was not bread with cheese on top, but somehow the cheese was integrated into the flour to make a dense, spongy and oh-so-tasty snack.